Deficiency of qi and blood causing fatigue, dry hair and skin, pail complexion, cracked nails, dizziness, poor memory or concentration. Menstrual disorders such as amenorrhea, scanty or irregular periods or following heavy periods. Anemia, dizziness, heart palpitations, optic atrophy and slow healing wounds due to deficiency of qi and blood. Following childbirth, surgery and prolonged illness are some of the imbalances satisfied clients have used this product for. Tonifies Qi and Blood, Regulates Menstruation. 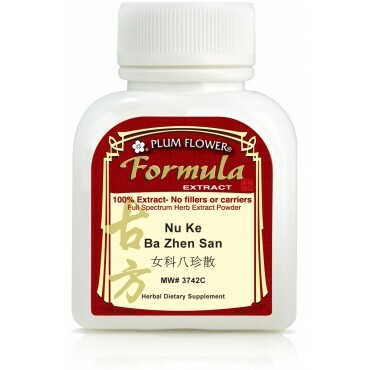 Rehmannia glutinosa root-prep, Angelica sinensis root, Paeonia lactiflora root, Codonopsis pilosula root, Poria cocos fungus, Atractylodes macrocephala rhizome, Ligusticum chuanxiong rhizome, Glycyrrhiza uralensis root. - Shu di huang, Dang gui, Bai shao, Dang shen, Fu ling, Bai zhu, Chuan xiong, Gan cao.